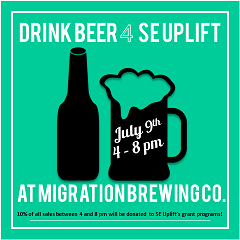 Migration Brewing Company has graciously offered to host a Dine-Out evening in support of SE Uplift’s renowned grant programs! We have humbly (and excitedly) accepted their invitation. It’s simple; rally your friends, family and neighbors, come on down to 2828 NE Glisan Street grab a seat, order dinner and a drink anytime between 4-8pm on July 9, 2014 and show your neighborhood coalition some love. 10% of all sales will be donated to our cause and in the end, will directly benefit any number of our 20 neighborhoods. What’s not to love about good food, good company and a the warm fuzzy feelings that come from supporting your community?